Tympanum designed by a local artist. 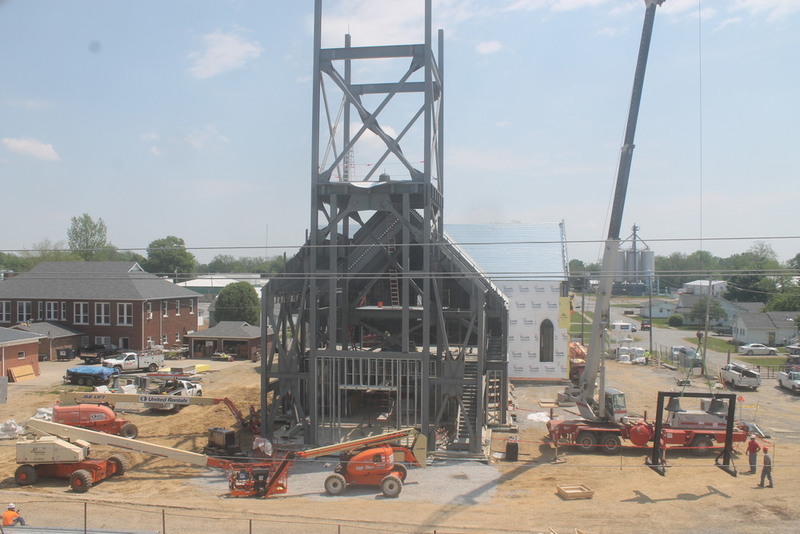 On May 6, 2015 the bells of the former St. Joseph Church, Ridgway, Illinois were raised into position in the new St. Kateri Church, Ridgway. St. Joseph's was demolished by a tornado in 2012. A large crowd of parishioners and townspeople gathered to watch the bells hoisted into place in the new church which is expected to be completed by September of this year. On November 21, 2014 the groundbreaking ceremony was held for Our Lady of Good Voyage Chapel in Boston MA. Work continues into a third month in Ridgway, Illinois on the foundation for the Church of St. Kateri Tekakwitha, Ridgway, Illinois. In the foreground is the vault under the tower. Beyond the foundation under the nave is nearing completion. This week the Contractor, Poettker Construction, has been preparing the utilities under the slab with expectation that soon they will be pouring the slab. We were recently commissioned to design additions and renovations for the Messiah Evangelical Lutheran Church in South Windsor Connecticut. The church occupies a modern building in a commercial area that is rapidly developing. The congregation wishes to add space in a number of areas throughout their exisiting facility. Cram and Ferguson has been commissioned with designing the restoration/renovation of the Holy Cross Chapel at the Holderness School in Holderness, New Hampshire. The brick Chapel which was designed by Charles Coolidge Haight in 1884 is treasured by the school community. July 11, 2014; Construction is fully underway on the foundation for the new church for St. Kateri Tekakwitha Parish in Ridgway, Illinois. St. Kateri is in Belleville Diocese and composed of the towns of Gallatin County in southern Illinois. Construction began officially on June 1 and has been underway for more than a month. Construction begins next week on St. Kateri Tekakwitha Catholic Church in Ridgway, Illinois. The 12,383 Square Foot church which will seat 400 has a construction cost of $ 5,600,000 or approximately $ 450 per Square Foot. The church will be clad in a local limestone quarried nearby in Missouri. St. Kateri is a replacement for the former St. Joseph's Church that was destroyed by a tornado on February 29, 2012. In 2014 we celebrate our 125th year as an architectural practice. Over the 125 years we have seen over 2500 projects, some 400 church projects of all sizes and denominations, work in 44 states and four foreign countries. We began the year with a weekend long celebration of the 150th birthday of the founder, Ralph Adams Cram on December 13th and a party celebrating the firm and its many families on December 14th. The party was attended by two past Principals, David Hulihan and Austin Cribben, a number of past workers and many clients, friends, family and colleagues from recent work.